Your tax deductible donation is so important at the MKC. 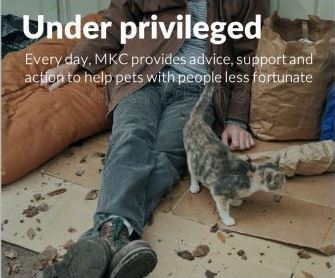 The MKC is the frontline of Animal Rescue. Make this years tax deductible donation count. We recognise this time of year you are asked to donate to many worthwhile causes. We present our track record this year for your consideration. The MKC is at the coalface of animal rescue. A place where many do not go. We pull animals out of death row and off the street, we treat their injuries, help them recover and find them homes. Several hundred animals were directly rescued this year by the MKC, in our hands and in our vets. All need help, many are injured and some face a bleak future without our support.You, our sponsors make this possible. 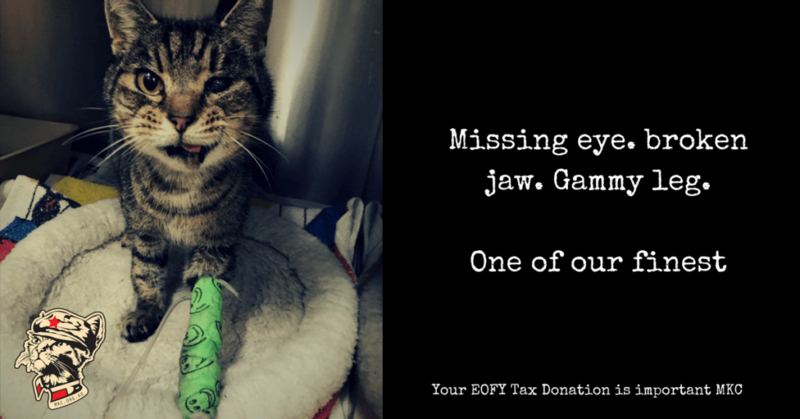 Artemis came to MKC with a broken leg with bone protruding, a damaged eye and suspected broken jaw He had been in this pain for at least 4 weeks before the owner dumped him at the vet. Artemis didn’t have a broken jaw but the impact had smashed the left side of his face so badly it could not be repaired and his jaw would be forever out of alignment so his other canines were also removed that were pushing into his upper palette. We saved his leg He was such a trooper though recovery and rehab and his check ups at Fox Valley Animal Hospital and he wormed his way into everyone’s heart who met him. Artemis now has two other cat siblings and a very loving family who adore him, especially his dad. I’m so glad MKC saved Artemis as it’s never too late to find your happy ever after. In May several pregnant mums were dumped at the pound. They are overloaded and have again had to resort to a “Kill List” as cages are all full. 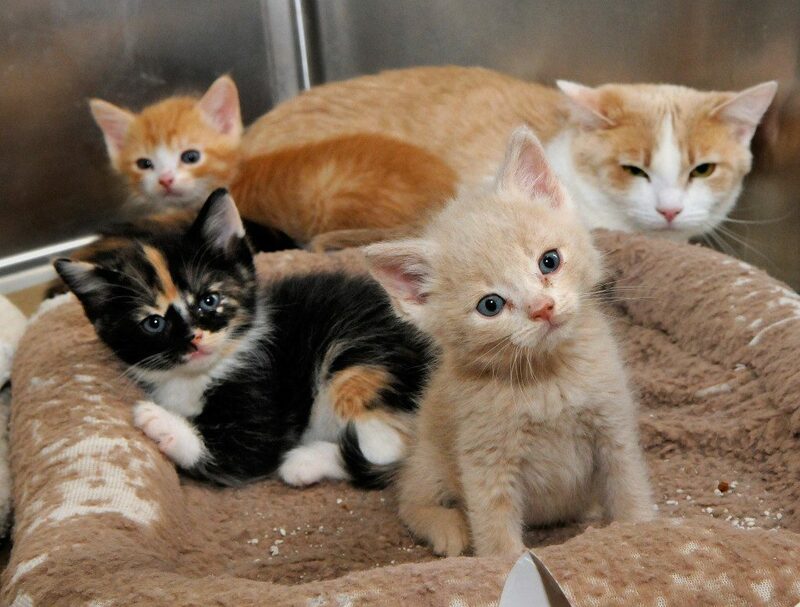 Mothers giving birth in the pound are always at risk and kittens started dying. We had to act. This was a huge rescue. There were so many pregnant cats in the pound and no chance of them being saved. None. No one will adopt them . . babies were being born in cages and dying. Kittens are sick. This was a well thought out operation run by awesome volunteers. The pound was incredibly well organised, we had drivers lined up, the vets put on extra staff and everything had a schedule. At 11am the cats were pulled . . midday at the vet and at 2pm there were five drivers going in different directions around Sydney to bring them to their foster carers. It’s difficult to imagine how this poor animal survived. 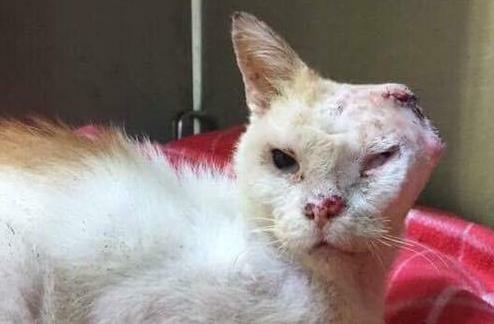 Tortured, burned, blind . . he was found in a toilet block in a park hiding, begging for scraps of food. 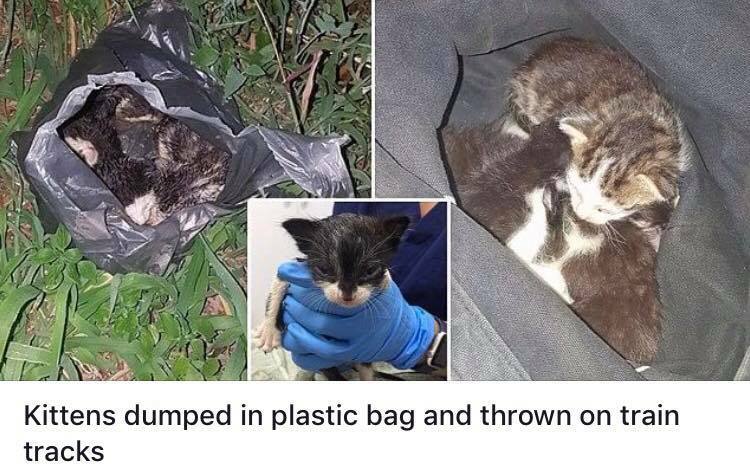 A local friend of the MKC found him starving and cold, just hanging on to life and at the mercy of whoever had done this to him. His ear had been hacked off and he suffered several burns to his poor battered body. No microchip, no way of tracing who had done this. He needed safety, warmth and the support of a caring team to turn his world around. Fortunately the locals involved MKC and we had supporters. You MKC’s vet team took Champers in and he was immediately in intensive care, life saving fluids, surgery and support was given. Support came from all over the country to help this poor boy. A team even knitted him jumpers as his skin was badly burned and unable to grow back. After 2 months Champers had his first purr and became a part of the MKC family. Even though it was a brief time, he finally found love that he had never experienced. Old mate was found like this in a suburban temple. His body was broken, he was being given offerings for “luck”, he was sleeping in old cardboard boxes in freezing conditions. Because he couldnt walk he couldnt toilet, so he slept in his own poo. He dragged himself out of his bed every day to beg for food and no one was going to do anything about it. A visitor to the temple spotted him and immediately got this video over to the MKC. One of MKC’s ready team went to the temple and immediately got him out of there and into the arms of our amazing vets. His outlook was bleak. 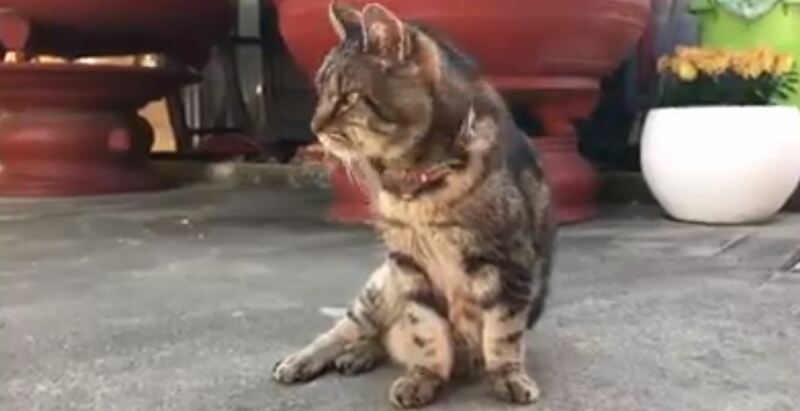 We were told he may only have days to live . . but then he started to recover. Good diet and access to proper nutrition started to repair his weak bones, his legs started to recover. Within 6 months Old Mate was up and walking. He now has a new life with an Awesome MKC carer in Drummoyne. The same lady who did the mercy dash to that temple. The Mini Kitty Commune rescues a and rehomes abandoned and neglected catst through a network of volunteers, foster carers and supporters. We at the pounds every week taking what we can before they get killed. Often we punch well above our weight when no one else can. Pregnant, sick, injured. We also take animals off the street, from domestic situations and in horrible home environments before they get to the pound. Not an easy task. Homeless and underprivileged. With the increasing issue of housing affordability ruining the country, MKC has supported many homeless and underprivileged people. 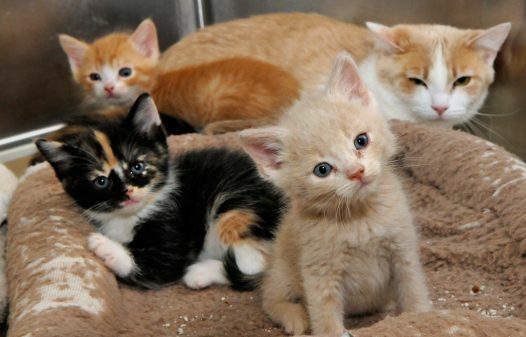 We have provided housing for cats of people who had become homeless or needed respite care. Some of these cats are still with us today! Street Rescue. We also worked closely to support those who needed a leg up with supplies and product, giving medical product to vet nurses to do site visits, health checks helping desex cats for people who could not and a little leg up here and there. Supporting other rescuers. We also continued to support other rescue organisations with help and food. 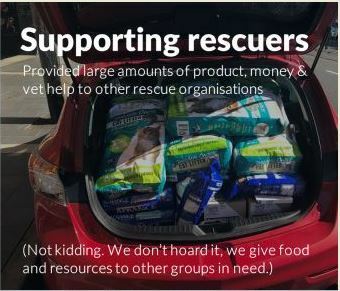 This year we delivered around 25000 meals to other rescue groups around NSW no questions asked, working both directly and indirectly through rescue aggregators. This is food and support we’ve either purchased ourselves or was donated by organisations that didnt know how to get it to the frontline. We do. We also have provided product and financial support to tiny grassroots rescue organisations in Thailand and Indonesia. (Baan Unrak Thai Animal Shelter and Vila Kitty) We think we have it hard here, these organisations are doing street rescue, open air surgery in the toughest of environments. We ship them products and when we can get them support they cant get as easily overseas. ADMIN@MKC.ORG.AU (IT’S OUR TEAM INBOX).